Ask the RD: What can I do to protect my skin from the sun? We know that protecting our largest organ is a big deal and sunscreen is our usual go-to when it comes to sun protection. However, science shows that most harmful UV exposure happens when our skin is not protected. Think about all the times you go outside without any sunscreen on and now add that up for your life span! More than 1 million new cases of skin cancer are diagnosed every year (1 out of every 3 people) and the #1 risk factor is UV exposure. So how can plants be exposed to the sun and yet still handle the environmental stress? Phytochemicals! These are the chemicals containing antioxidants that protect plants from germs, fungi, and bugs. While for humans, the antioxidants in plants tackle harmful free radicals (which can result from prolonged sun exposure) that damage our body tissues. Essentially, the answer is to eat more foods with rooted from the ground! Depending on their size, carrots have between 8,000-15,000 mcg of the antioxidant beta-carotene which can become more "bioavailable" by chopping and roasting according to the results of this Swedish study through Chalmers University of Technology. Our eyes are also subject to being harmed by the sun's rays and the vitamin A (or Retinol) in carrots are imperative in sustaining our vision, so keep those eyes bright and beautiful - just "throw -em in the bag" the next time you're in the produce aisle! Limonene is a compound that can be found in citrus fruits, specifically the peel, and is noted for it's anti-inflammatory properties and anti-cancer benefits! Studies have even linked it to being a viable treatment for breast cancer. One study funded by the French Ministry of Research as a result of winning the Award for Innovative Research,’’ used an Orange Peel Extract (OPE) mist on 21 women aged between 53 and 69 years old used OPE for 29 days. The results were a decrease in the number, length, depth, and surface of the wrinkles specifically around their eyes. RD Tip: Limonene itself is not water soluble so you won't get the good stuff just by throwing some oranges in your water bottle. Since most of the compound is found in the rind of the citrus fruit simply add a little orange or lemon "zest" to your salads and other fave dishes. It's more than a garnish, it's nutritious! Drinking Green Tea has been linked to disease prevention and even slowing cancer progression as it seems to interfere with almost every stage of cancer formation (initiation, promotion, and progression). Surprisingly, this study reports that only 40 minutes after drinking green tea, the antioxidant "power" of the participants plasma & urine were increased. This increase in antioxidant absorption could lower oxidative damage to DNA and decrease one's risk for cancer including skin cancer. In addition, this study provided evidence that drinking green tea often, increases the level of these antioxidants in your skin (they actually took skin samples and measured the antioxidant amounts in the samples) potentially providing protective affects against harmful sun rays and wrinkles! In 2013, the Journal of Cosmetic Dermatology found that in by 'activating" Green Tea Extract with an enzyme, wrinkles were decreased even more than the extract version without the activating enzyme (difference was about 27%), further supporting that green tea extract is a viable tool as an anti-wrinkling substance. 1 large strawberry can contain up to 10.6mg of Vitamin C making it a great source of the nutrient. Vitamin C, (AKA ascorbic acid) plays a part in the creation of collagen. Collagen is a protein that is basically what makes up our hair, nails and skin. The anthocyanins (what makes strawberries red) found in strawberries have anti-inflammatory, antioxidant, and anti-tumor properties that could explain the recent connection to their UV protective benefits (science has not found the direct relationship for this just yet). In a study done by the Journal of Agricultural Food Chemistry, the researchers added strawberry extract to skin cell cultures then exposed them to ultraviolet light that would be equivalent to 1.5 hours in the mid-day sun. The skin cultures with high doses of strawberry extract seemed to have less cell damage after UV exposure compared to those with less or no strawberry extract. RD Tip: Strawberries are actually one of the top fruits for being pesticide laden so when possible for your wallet, go organic! One study done by the British Journal of Dermatology had 20 healthy women expose their skin to UV light before and after half of them ate 3 tablespoons of tomato paste (which is rich in lycopene) a day or for 3 months. There was significantly less DNA damage done to the skin of those who had been eating the tomato paste. In addition, Erythema, (which is the reddening of the skin as a result of injury or irritation), was actually found to be 40% lower in subjects who ingested tomato paste for 10 weeks compared to those who did not. The USDA's SR.21 Report indicates that 1 cup of whole flax seeds contain 42.7 mcg of selenium and according to this study, flax seeds have the highest content of pre-cursors for lignans (a cancer-fighting compound) that work with your gut's good bacteria to create complete lignans- it's kinda a team effort. 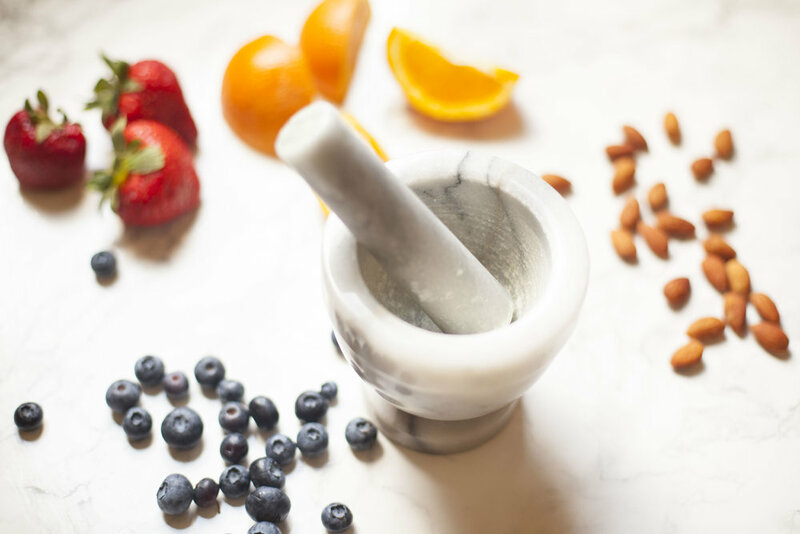 The gut flora in your intestines (or good bacteria) is responsible for detoxifying or activating varying compounds that are ultimately made available to your body! That's really working from the inside out. Supplementation of flax seed oil or (1.5 tsp of flax seeds) has been shown to diminish skin sensitivity, improve skin barrier function along with the skins general condition. Specifically, this study reported an increase in “trans epidermal water loss” and an increase in skin hydration! My favorite part about flax seeds is that you can bake them without destroying the omega-3 healthy fats and store them for months without spoilage or oxidation. Ask the RD: Is ground flax seed better than whole? Critical Control Point: After six months of being stored in an air-tight opaque container ground flax seed should be discarded while whole flax seed will last up to a year in the same conditions. Be sure not to use a clear container as this will speed up the shelf stable timeline. Even with it's green in color, spinach is a great source of beta-carotene and per data published by the U.S. Department of Agriculture (USDA), about 3.5 ounces of raw spinach provides around 5600 micrograms of beta-carotene. Spinach is also a great source of Zinc and Vitamin E all three of which are integral in maintaining skin health. RD Tip:Since beta-carotene is a fat-soluble nutrient, eating a spinach salad with healthy fats (nuts, seeds, olives, avocado) and salad dressing is a great way to make sure your body can absorb as much as possible. Berries specifically have been shown to have increased amounts of antioxidant activity according to this study published in the Journal of Agriculture and Food Chemistry. 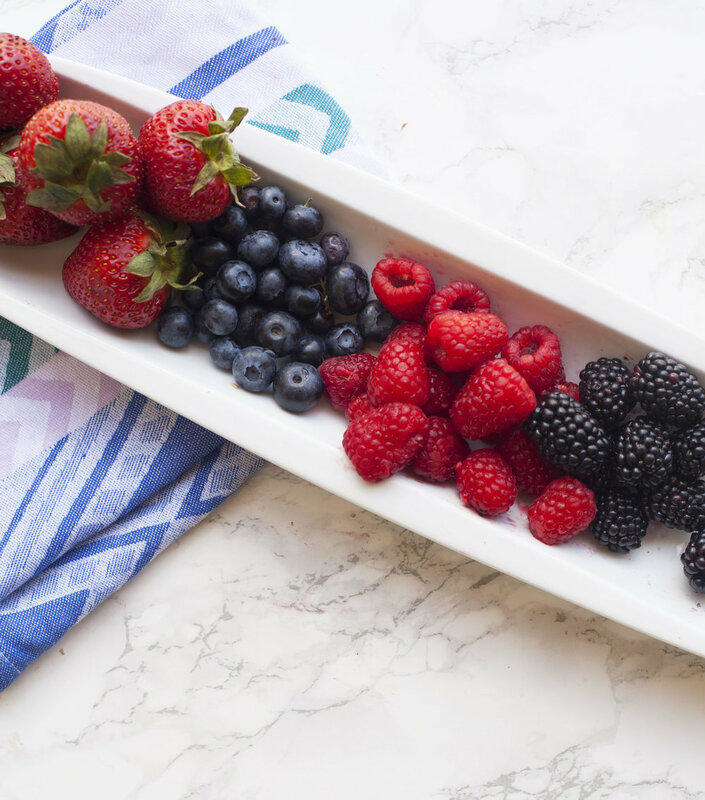 Ask the RD: What berries are the best? The darker the berry, the sweeter the juice! Here's a look at a few travel-friendly snacks you can take to the beach, backyard BBQ, the park, or to the pool. The fruit skewers are also great frozen and the perfect opportunity to bring the kids into the kitchen! Creating them is a fun activity to do with family and friends while you wait for the grill-master to finish up the main course. Not only does it help pass the time but, it's also the perfect time to talk to little one's about fruits and where they come from! I've got a slight obsessions with citrus + spicy flavors and this satisfies my craving every time. It reminds me of the curbside fruit I had when I traveled to Ibiza without all the extra salt! I also like to squeeze a little lime juice for added tang and balance the sweetness. Something about Summer and skewers go together, am I right? I choose a fat free feta for my cheese and you can add your own twist with a drizzle of balsamic vinaigrette or add some cool cucumber. *Roots Reboot is not endorsed by Beauty Counter. Beauty Counter is a brand I recently fell in love with because they go above and beyond when it comes to non-toxic ingredients AND they use plant-based ingredients! Their standard of refusing to use over 1000 chemicals in their products surpass what is legally required in the United States. The”never list” is made up of more than 1,500 questionable or harmful chemicals that Beauty Counter never use as product ingredients which includes the over 1,400 chemicals banned or restricted in personal care products by the European Union, plus additional chemicals screened by Beauty Counter and found to be of concern. Find out more about Gregg Renfrew and her mission to get safer products in the hands of everyone here. Being that it's made from beetroot and therefore includes arginine (a substance related to improving circulation), this is a smart buy for your skin and protecting it from the sun this Summer. This lip conditioner sses shea butter from shea nut and includes peppermint and rosemary fragrance that are sure to keep your lips happy and moist in the summer heat. Tangerine, lemon, orange, and aloe vera are all packed into this amazing sunscreen. You cant deny the data in our list above when it comes to the skin benefits of these plants. No wonder this product is one of the company's best sellers! -With Orange Peel Extract (slot #2 on our list!) these are sure to do wonders for skin conditioning and keeping those wrinkles at bay. ASK THE RD: Is coconut oil a good moisturizer? Refined coconut oil has been bleached, and deodorized. The oil is derived from dried coconut meat known as "copra" which has to be purified with bleaching clays because contaminants arise during the drying process. High heat is then used to deodorize the coconut oil to remove its distinctive odor and flavor. Since refined coconut oil is more shelf-stable, it is usually cheaper. Unrefined coconut oil, however, is richer in phytonutrients than refined coconut oil. Polyphenols, (they act as antioxidants in our bodies), are destroyed by the bleaching and heating process used to produce refined coconut oil, as a result you have more antioxidants in the unrefined version. Due to the purity of the unrefined version, it also has a shorter shelf-life along with being a tad more expensive. Aloe Vera is not only good for topical application but it is a super food. Therefore, it is not surprising that the Egyptians used to call it the "Plant of Immortality." Aloe vera gel has been reported to have a protective effect against radiation (sun) damage to the skin and is a good source of vitamins (vitamin A (beta-carotene), C and E) and minerals (calcium, chromium, copper, selenium, magnesium, manganese, potassium, sodium and zinc).